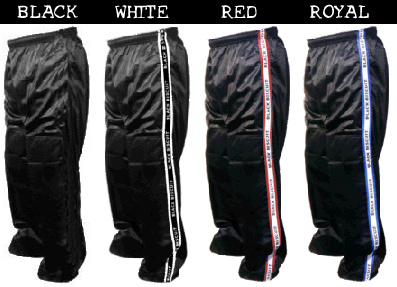 The "Rookie" pant is designed to wear on and off the rink. The fabric for this model is a lightweight breathable nylon micromesh with "Biscuit Cloth" panels over the lower front portion of the legs. 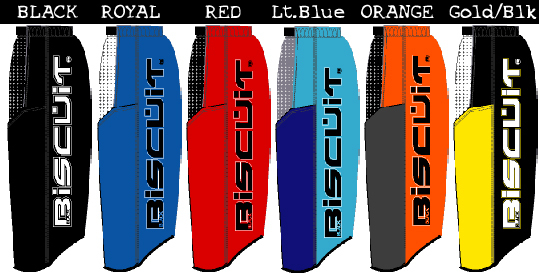 New "multi biscuit" side stripes complete the pant. This pant is constructed with an elastic waist drawcord and is easy to get on and off. The baggy fit allows this pant to fit over your hockey girdle. Biscuit's new pant incorporates "BISCOMESH" The latest fabric innovation which is lightweight and has the airflow characteristics of nylon mesh with a feel and look of your favorite pair of pants. Biscomesh is used on the upper front, backside, and crotch areas of the pant. "Biscuit Cloth" The origional durable Biscuit fabric is used on the front from just above the knees to the bottom of the pant. U-Shaped cut on the bottom keeps this pant from catching in the back of your skate. Elastic wasteband and cinch belt along with pockets. The Classic "Pro" pant is designed for the top level players who by their aggressive nature are going to beat up a pant. This pant is made to withstand the punishment. The "Pro" is constructed using the finest Nylon Flight Satin material with Biscuit Cloth panels over the lower front portion of the leg. An elastic waistband with belt www.secure this pant in any fall. The "MVP" pant is designed with the best features Biscuit has to offer. Adhering to the Biscuit standard of excellence, the MVP pant is designed to withstand punishment and make you look good with its multicolor designs. A back mesh panel has been incorporated to give this pant the extra breathability desired by you the player. An elastic waistband with belt www.secures this pant in any fall. If you want the best of Biscuit, then the MVP is the model for you.